A Cumbrian coach and bus company is to introduce a summer service which can be used by cyclists. 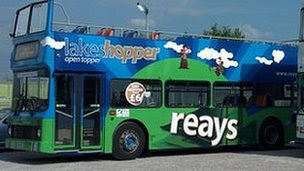 Reays will run a single-decker on the route between Cockermouth and Keswick, via the Honister Pass, which will have a bike rack fitted at the back. This will give cyclists easy access to mountain trails and remote roads, without disturbing other passengers. The company is also launching an open-topped bus so tourists can enjoy the views between Keswick and Seatoller. Both routes will run between 20 July and 4 September, to coincide with the main summer holiday period. Managing director Chris Reay said: "Obviously it's a very popular area for tourists but we are also hoping that local people, including families, will enjoy getting direct access to such remote locations from two busy towns. "Both the 77R and 78R will actually be following part of the route for the Tour of Britain bike race when it's in Cumbria later this year."